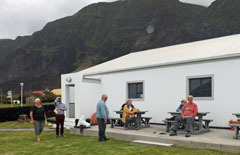 Report and photos of the visit of the RMS St Helena to Tristan da Cunha on 19th-22nd November 2013, which included a visit by Governor Mark Capes. where the ship is due to return on 4th December. so the short visit was packed with important events which we catalogue below. The RMS arrived on schedule at 08.00 on Tuesday 19th November. It couldn't have been a more perfect day, good sea conditions, calm and sunny, which allowed most of the visitors to come ashore. 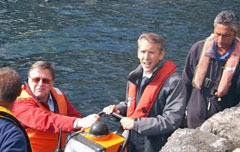 Mark Capes (2nd left) with Administrator Alex Mitham (3rd left) arriving in the harbour. 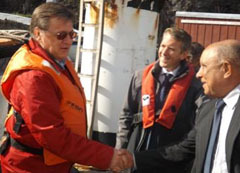 After meeting the Administrator Alex Mitham and Police Inspector Conrad Glass on board the RMS, Governor Mark Capes came ashore where he had coffee with the Administrator and Hasene Mitham and then met the Deputy Chief Islander Lorraine Repetto and other members and the Island Council. 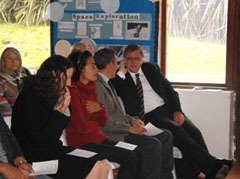 He then joined the Councillors and Heads of Department in the Council Chamber for a sandwich lunch. 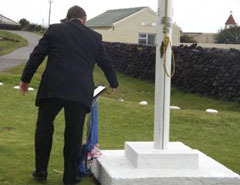 At 13.00 Governor Capes visited St Mary's Anglican and St Joseph's Catholic Churches before touring the island grave yards. 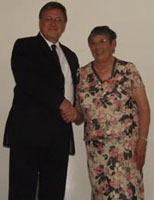 After a tour of the Potato Patches the Governor visited the home of Chief Islander Ian Lavarello (presently in Cape Town) before attending an Evening Reception held in the Prince Philip Hall to meet other members of the community. At 0900 other passengers started disembarking from the RMS St Helena and the 69 that were to stay ashore met their hosts. 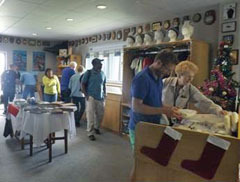 The Post Office and Tourism Centre, (including the Museum, Handicrafts and Café da Cunha with refreshments) were all open, as were the Island Store, Rockhopper Gift Shop and Desiree's Crafts. Visitors enjoyed novelty tractor rides laid on throughout the day and also took part in walking tours of the Settlement, 1961 Volcano and Potato Patches. Right: Visitors enjoying the novelty of a ride on a trailer ready for their (white knuckle?) ride around the Settlement. 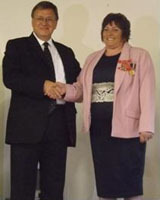 Dr and Mrs Andreas Reuter renewed their wedding vows in the Council Chamber, the ceremony was postponed until 13.10 to allow their luggage to come ashore. After the ceremony drinks and snacks where served at the Albatross Bar. Photos show: Left to right ~ Administrator Alex Mitham leading the ceremony of vow renewal ~ The Cake ~ Scene in the Albatross Bar when snacks and drinks were served to honour the vow renewal. 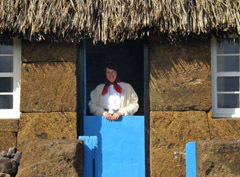 I wore traditional dress to welcome visitors and show them around. 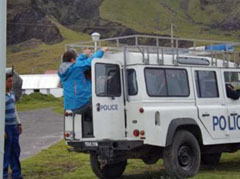 The day started with a group of 20 visitors climbing into the police Land Rover at the Post Office and Tourism Centre to be taken to the patches for a hike to the Base. Shirley Squibb's photo shows one of the Land Rovers being loaded ready for the four mile journey to The Bluff for a climb to the Base at Burntwood. Mr Carl thanked everyone for attending and gave particular thanks to Michael Swales and the Tristan Association for their ongoing support. 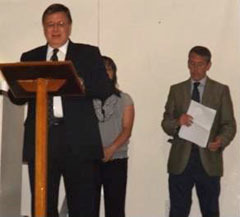 He thanked Andreas Reuter who had kindly donated some IT equipment to the school before warmly thanking all staff and students for their hard work. 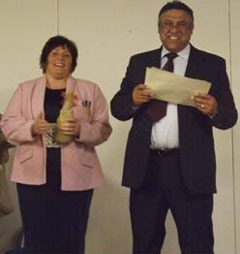 Repetto and Caryn Green with their IGCSE and Tristan Studies Certificates. Dawn and the Tourism Team also rewarded the children with a goody bag. 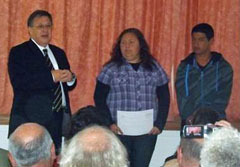 Right: Governor Mark Capes addresses those present having presented certificates to Caryn Green and Riaan Repetto who are looking on. 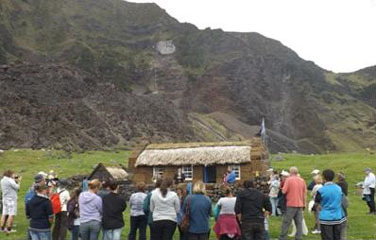 Left: A crowd of Tristan Islanders and RMS visitors gathered in front of the Traditional Thatched House Museum listening to a speech of welcome from: Right Governor Mark Capes as he stood alongside Tristan Administrator Alex Mitham. 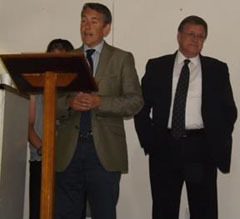 Alex Mitham and Governor Mark Capes both addressed the crowds gathered at the Thatched House and outside the Prince Philip Hall for the two plaque ceremonies. The following is Alex's prepared text, which in fact was delivered more informally, and with planned contributions from the Governor. Thank you for coming today to recognise and celebrate the 50th Anniversary of the Islanders’ return to Tristan. 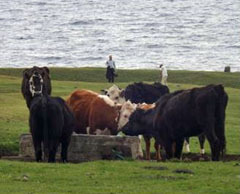 People have travelled from far and wide (an understatement for visiting the remotest inhabited island in the world!) and it is greatly appreciated that so many can be with us this year. 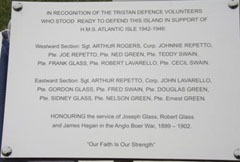 There are two plaques today which not only highlight that momentous occasion honouring the islanders' return in 1963 - but also honouring those Tristan Service Personnel who have fought for the UK and protected these shores. The community has always had a strong bond with the military, not least from the actual founding of the community - through the wars and to the present day - and we were fortunate enough to recently welcome the HMS Richmond to our shores, reminding us of that bond. The dedication to protecting the island and serving in the military is one that should be rightly recognised, and I am pleased we will be able to do that today. In regards to the return to the island - From speaking to the community - I can only imagine what it was like in the days after the eruption and subsequent evacuation. I know the stay back in the UK was not perfect for everyone, but I have - and continue to be - incredibly humbled by how resilient the community is, and how it continues to triumph against all the elements – quite literally in fact – from the ever changing storms, fires, and shipwrecks - to not only survive - but to thrive – and is eager to forge ahead, continually looking to new horizons to ensure the community’s long term future. I think this is a time to not only reflect on the past, recognising what you, your parents and relatives went through - but to also look forward. The world however much we wish it didn’t – continues to change. 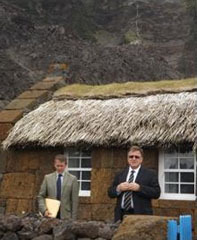 Traditions can be lost - but the Island as ever - does not lie down and let that happen – this Tristan House is a shining example of keeping traditions alive, promoting your history and wanting to ensure visitors and islanders understand island life. The 1961 volcano will always be an ever present reminder of how fragile life can be, but it is also an example of something the whole community has overcome – a show of resilience - of independence. You’ve conquered the elements and continue to do so. However I really think the next couple of days are not just about celebrating a return to the island, but really about celebrating a community. A community who had the tenacity - the heart - the spirit to return to your island – to start again - to turn around a tragedy into a success, to recreate your community – on your terms – and are still lucky enough to call the remotest inhabited island in the world – your home. 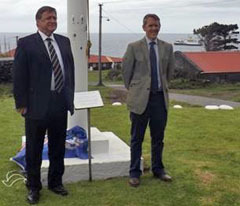 It now gives me great pleasure to hand over to the Governor of Tristan da Cunha, Ascension and St. Helena, his Excellency Mark Capes who would like to say a few words about the celebrations. 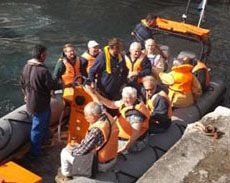 to honour the islanders who returned to Tristan in 1963. 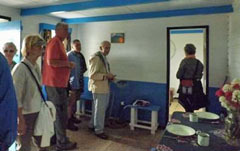 Right: Visitors tour the Traditional Thatched House Museum with Tristan Association Chairman and President Michael Swales centre in the white jacket. 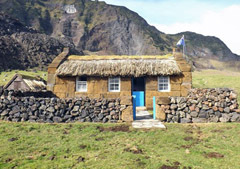 Michael made his first visit to Tristan da Cunha with the Gough Island Scientific Survey in 1955 when all the island homes were thatched. The crowd gathering to witness the unveiling of a plaque commemorating Tristan service personnel. A second plaque unveiling by HE Mark Capes followed on shortly afterwards as a crowd gathered outside at the Prince Philip Hall where a commemorative plaque honouring Tristan service personnel was unveiled. in front of the Tristan flag pole. 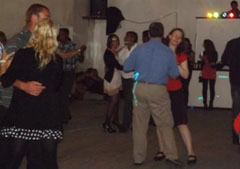 for photos of this year's event. Relaxing on the Post Office and Tourism Patio after a busy day. 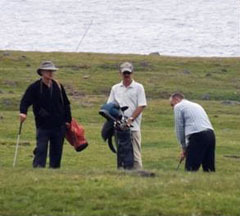 - without a birdie in sight perhaps? Thank you for all coming tonight. As everyone knows this is a very important occasion for the island. Not only are we celebrating the 50 th Anniversary of the return to Tristan after the volcanic eruption, but we are recognising islander’s dedication to the community, while also welcoming the Governor and many past friends and colleagues back to the island. 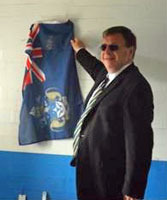 Celebrations have been happening far and wide from Glasgow, Southampton, Isle of Man and Denmark to name just a few. The events of 1961 and 1963 touched so many lives and continue to do so. The 50 years since your return has probably seen the most change in the community’s history. Sometimes for the better – sometimes for the worse - but throughout that time the community’s tenacity to survive and persevere has shone through. In the short time I have been here - I have been humbled by the quiet determination and work ethic – and to be honest many other islands could well learn a thing to from you. This is an incredible island – but it’s not a utopia, it’s not Disneyland. It’s not perfect. No place ever is. People have to work hard to survive – I don’t need to tell you that. Island life will always be difficult, but as ever - you adapt, you overcome any obstacles. The evacuation and hardships you had to endure show that. But the island bounced back, gaining world-wide recognition and respect. The community today may well be very different from the one in 1963 – but some things never change – the incredible local knowledge of your environment, the warmth of hospitality, the kindness, the cooking! the duty to family and commitment to the future of the community will always remain. And this work ethic and devotion to the community can be highlighted tonight as we have several awards to present to people who have shown their dedication to Tristan. 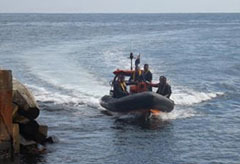 Their efforts have ranged from ensuring the community remains solvent, to assisting the elderly, and ensuring the infrastructure stays running, to helping with environmental emergencies while also fishing the famous rock lobster – to ultimately and maybe most importantly welcoming new life into the community. Their actions are all different– but that selflessness, professionalism and generosity run throughout each and every person. 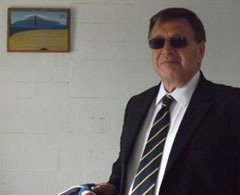 So without further waffling from me - I have great pleasure in introducing the Governor of Tristan da Cunha, Ascension and St. Helena - his Excellency Mark Capes who would like to say a few words about the celebrations, and has very kindly agreed to make the presentations tonight. 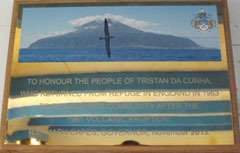 New Year's Honours List 2011.
in the Birthday Honours List 2012.
of Tristan da Cunha over many years. 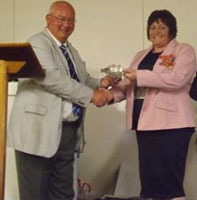 HE Mark Capes also presented MV Edinburgh Captain Clarence October with a MBE for his services to the community of Tristan da Cunha following the valuable assistance the ship provided to ensure the safety of the crew of the stricken vessel MV Oliva which ran aground at Nightingale Island in March 2011. 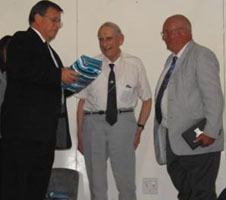 Ladies and Gentlemen 50 years ago this month the community of Tristan returned home from the United Kingdom, having spent 2 years living in what felt to them like exile. The 10th October 1961 saw our world turned upside down by an erupting volcano, forcing the community to evacuate the island to face an uncertain future in a world they did not know or understand. However 2 years living in a modern society only strengthened their tenacity to return to a small island we call home. To live our lives as God intended, at one with nature. This evening we are here to celebrate this event with esteemed guests: our Governor,; Captains Clarence, and Rodney their crews and passengers; Tristan Government UK Representative Chris Bates and his family; Chairman of the Tristan Association Michael Swales; our partners Andrew and Dorrien from Ovenstone Fishing; and representatives from DFID who we hope will fund a new harbour, which is the life line of the community. Conrad went on to announce details of the recent Philippines Typhoon Appeal that he had co-ordinated and for the full text see the separate Philippines Typhoon Appeal Page. A strengthening wind meant that RMS passengers were loaded early from 09.30 on Thursday 21st November. Therefore the Thursday programme, including a Craft Day in Prince Philip Hall, a football match between Tristan Tigers and a team from the RMS, and a visit to the CTBTO (Comprehensive Nuclear-Test Ban Treaty Organisation) Station had to be cancelled. Only a tour of the Fishing factory went ahead, brought forward to start at 08.00. It was wonderful that the Governor was able to visit the island on such a special occasion and I was very glad we have such perfect weather for the visit. The Governor must be a good luck talisman! 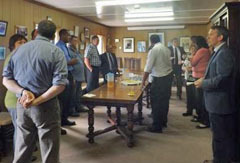 On Thursday 21st the Governor, my wife and I went onboard the RMS St Helena to meet the Captain at 10.30. While onboard, the Captain very kindly invited us to lunch at the Captain's Table. It was a glorious day and the passengers had a lovely view of the island and were able to view the Peak. Unfortunately owing to the increasing swell the Islanders who had done so much work on organising the visit were unable to also attend the lunch. The Island really did pull out all the stops to make this 50th Anniversary an incredible occasion, and the RMS passengers bore witness to the hard work and dedication of all the islanders. It was also lovely to see the celebrations on Bornholm island in Denmark - While we may be the remotest inhabited isle - we have friends across the globe! The RMS is a beautiful ship and I cannot thank the Captain and the crew enough for their kind generosity. I hope there may be further opportunities for the RMS to visit again during my tenure. My wife and I returned to the island at 1.30 as the RMS set sail for the onward voyage to St. Helena, via Nightingale and Inaccessible Islands. 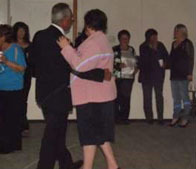 RMS passengers took part in Tristan fund raising for the Philippines Typhoon Appeal and while the ship departed the sponsored swim organised by St Mary's School was taking place. 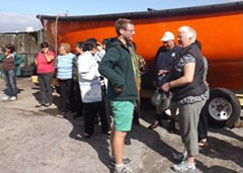 See the Tristan Philippines Typhoon Appeal Page for photos and reports of the fund raising events.